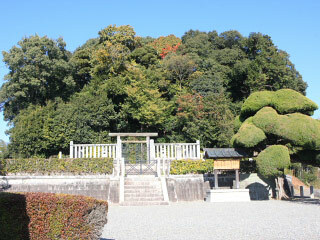 Kofun of Emperor Tenmu & Jito (天武天皇・持統天皇陵) is the mausoleum of the 40th Emperor Tenmu and the 41st Empress Jito. Emperor Tenmu is one of the powerful Emperor who built strong central government in Japan and conquered most of Japan. He became the emperor after the victory of Jinshin no Ran in 672. Empress Jito was the wife of Emperor Tenmu and became the emperor until their son became the 42nd Emperor. Do not enter the restricted area. Kofun of Emperor Tenmu and Empress Jito is located Asuka, Nara prefecture. It is 58m east-west and 45m north-south and 9m tall dome shape Kofun. The name is Hinokumaoouchinomisasagi. In 1235, thief broke through the chamber. There is a record of the inside of the chamber at that time. Unlike other ancient Kofun, this Kofun is highly confirmed as their Kofun with historians. Emperor Tenmu is the 40th Emperor of Japan. He was born in 686 as the younger brother of Emperor Tenji. In 672, he defeated Otomo no Oji, the son of Emperor Tenji, and built the new imperial capital in Asuka. This war was called "Jinshin no ran." He built a strong central government controlled by the imperial family and put power of other family away from the government. He also expanded the land of the empire to the west. He also made a record of the history of Japan, "Kojiki" and "Nihonsyoki." They are the oldest record of Japan exist today. Empress Jito is the 41st Emperor of Japan. She was daughter of Emperor Tenji and wife of Emperor Tenmu. After the death of Emperor Tenmu, she became the Emperor (Tenno) until their grand son, Emperor Monmu, became old enough to be the Emperor.